The American red robin, commonly found in Chicago, is the most important bird for spreading the West Nile virus. Although it can’t pass the virus to humans, more infected birds mean more virus-carrying mosquitoes. Chicago health officials are spraying insecticide Thursday night to kill mosquitoes on the Northwest Side. The area includes parts of the Albany Park, Irving Park and Avondale neighborhoods. The spraying comes after health officials found mosquitoes carrying the West Nile virus in those parts of the city, says Cort Lohff, medical director for environmental health at the Chicago Department of Public Health. Last week, the city sprayed insecticide on the south and northwest sides of Chicago. Lohff says the recent hot and dry weather has helped the mosquitoes breed faster, though cooler temperatures should slow them down. Based on a decade of observation, he says the Northwest and Southwest side are hotspots for the virus, while there is less activity in downtown Chicago and along the Lakeshore. He speculates it may be because the west has more of the birds that help spread the virus, like crows. The west side is indeed a hot spot, though crows are not the most important birds for spreading the virus, says Tony Goldberg, a professor of epidemiology at the University of Wisconsin-Madison, who has been studying the virus in and around south suburban Oak Lawn for the past ten years. 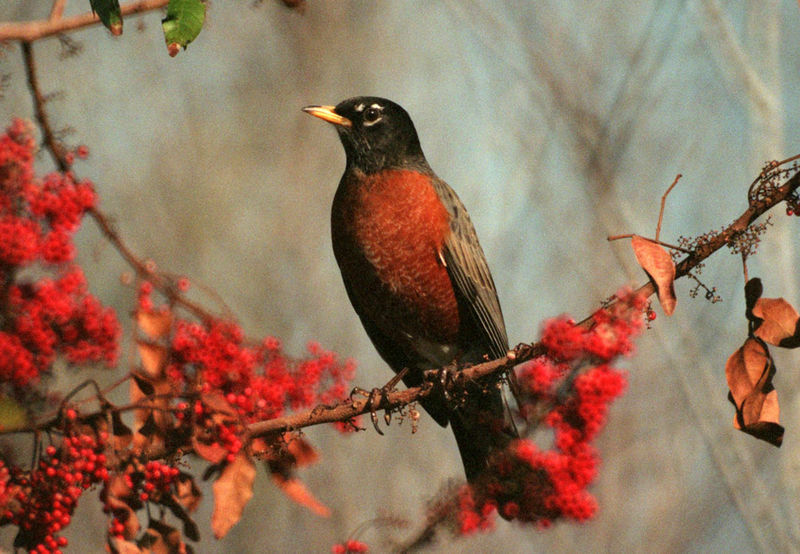 He says the American Red Robin, a bird that many Chicagoans will see hopping around on their lawns, tops the list of birds that carry the virus. The mosquitoes in Chicago that carry West Nile virus, culex pipiens, don’t really like humans, or mammals for that matter. They prefer birds, and the virus spreads whenever a mosquito bites a bird. They’ll bite a human if they can’t find a bird, but a human is a dead end for the virus. “So people are just unlucky recipients but they’re not part of the transmission cycle,” Goldberg says. He also points out not all mosquitoes carry the virus. But unlike vampires, the virus is seasonal, and based on his data, Goldberg and the researchers at his lab found the peak season hits every year around this time, and lasts until September. That’s probably because of the weather, which is the main factor in determining how quickly the virus can spread. The culex mosquitoes breed in stagnant water, such as abandoned swimming pools, rain barrels, flower pots, and catch basins for storm drains. If the weather is too dry, there won’t be enough water; if there’s heavy rain, it’ll wash the larvae away. But if there’s a hot and dry period after some rain, when the catch basins have standing water and rotting leaves, that’s prime real estate for culex mosquitoes. “It’s sort of this Goldilocks scenario where the West Nile virus does best where you have early wet weather followed by late dry weather,” Goldberg says. Remember how the West side is a hot spot? Goldberg has a different theory. His team found that area has an unusually high number of catch basins where the mosquitoes like to breed, and speculates that’s why it’s a hot spot for the virus. Apart from catch basins, the health of Chicago’s birds, particularly the red robins and sparrows that culex mosquitoes like to bite, also affects the spread of the West Nile virus, says Gabriel Hamer, clinical assistant professor of entomology at Texas A&M University. Before he went to Texas, he was part of Goldberg’s research group and recently co-authored an article about parasites and the West Nile virus in Chicago’s red robins and sparrows, which was published in the International Journal of Parasitology. If a human becomes infected with HIV, his immune system gets weak, making him an easy target for other infections. Similarly, Hamer found that a lot of American robins and house sparrows in Chicago carry parasites, including avian malaria, which involves the same culex mosquitoes as West Nile virus. Avian malaria doesn’t affect humans, but these parasites can weaken a bird’s immune system and make them better hosts for West Nile virus. “That would increase the efficiency of transmission where ultimately the more virus there is, then the more risk there is of humans getting exposed to it,” Hamer says. He’s planning future research that involves bringing birds and mosquitoes into a lab for controlled infection experiments. He hopes those results can lead to better modelling or even interventions in stopping the spread of West Nile virus. In the meantime, Chicagoans should wear long sleeves or insect repellent when they venture outside from dusk to dawn. So far, garlic has not been shown to ward off culex mosquitoes.